How to shoot and assemble time-lapse movies of the stars and Milky Way turning above Earthly scenes, all using DSLR cameras. Available worldwide only for MacOS and iPads through the Apple iBookstore. See http://tiny.cc/urdoqx for more about the book at iTunes. 50 embedded HD videos (no internet connection required) demonstrating time-lapse techniques. 60 multi-page tutorials with step-by-step instructions of how to use software: Adobe Bridge, Adobe Camera Raw, Photoshop, Lightroom, LRTimelapse, Advanced Stacker Actions, StarStaX, Panolapse, Sequence, GBTimelapse, and more. Numerous Photo 101 sections explaining the basic concepts of photography and video production (f-stops, ISOs, file types, aspect ratios, frame rates, compression, etc.). Numerous Astronomy 101 sections explaining the basics of how the sky works (how the sky moves, where the Moon can be found, when the Milky Way can be seen, when and where to see auroras). Reviews of gear – I don’t just mention that specialized gear exists, I illustrate in detail how to use popular units such as the Time-Lapse+, Michron, and TriggerTrap intervalometers, and the All-View mount, Radian, Mindarin Astro, eMotimo, and Dynamic Perception motion-control units, with comments on what’s good – and not so good – to use. • What are the best cameras and lenses to buy (cropped vs. full-frame, Canon vs. Nikon, manual vs. automatic lenses, zooms vs. primes). • How to set your cameras and lenses for maximum detail and minimum noise (following the mantra of “exposing to the right” and using dark frames). 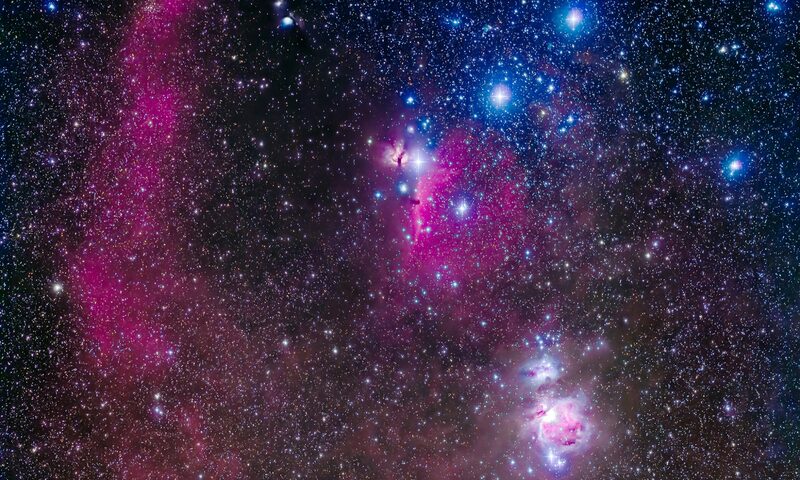 • How to shoot auroras, conjunctions, satellites, comets, and meteor showers. 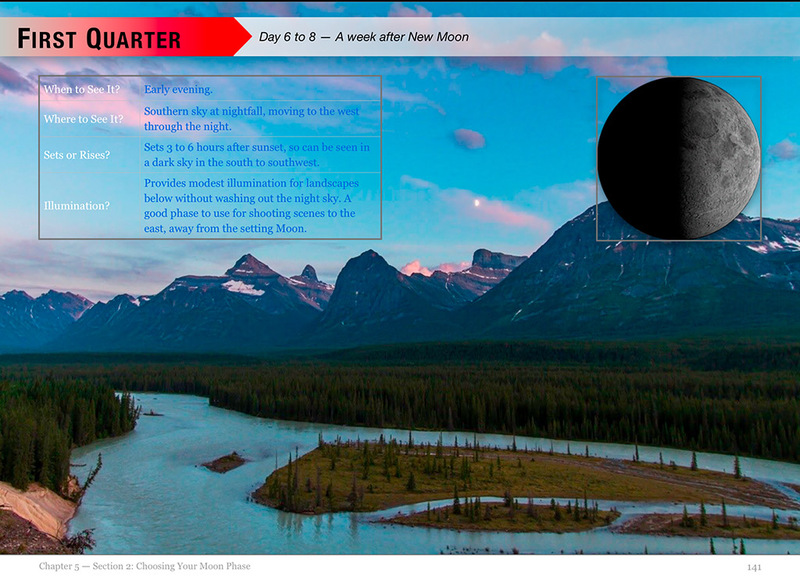 • How to shoot nightscapes lit only by moonlit, and how to determine where the Moon will be to plan a shoot. • How to shoot & stitch panoramas of the night sky and Milky Way, using Photoshop and PTGui software. • How to shoot tracked long exposures of the Milky Way using camera trackers such as the iOptron Star Tracker and Sky-Watcher Star Adventurer. • How to develop Raw files, the essential first step to great images and movies. 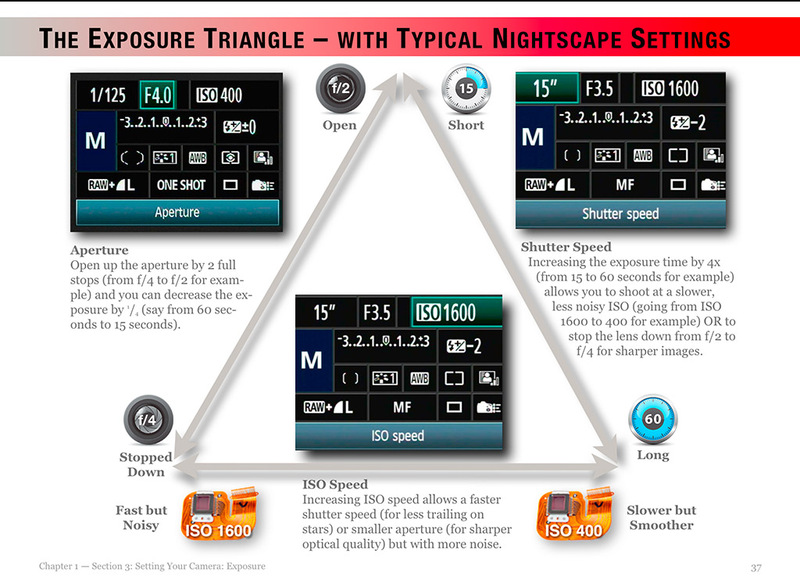 • How to process nightscape stills using techniques such as compositing multiple exposures, masking ground and sky, and using non-destructive adjustment layers and smart filters. • How to shoot and stack star trail images made of hundreds of frames. 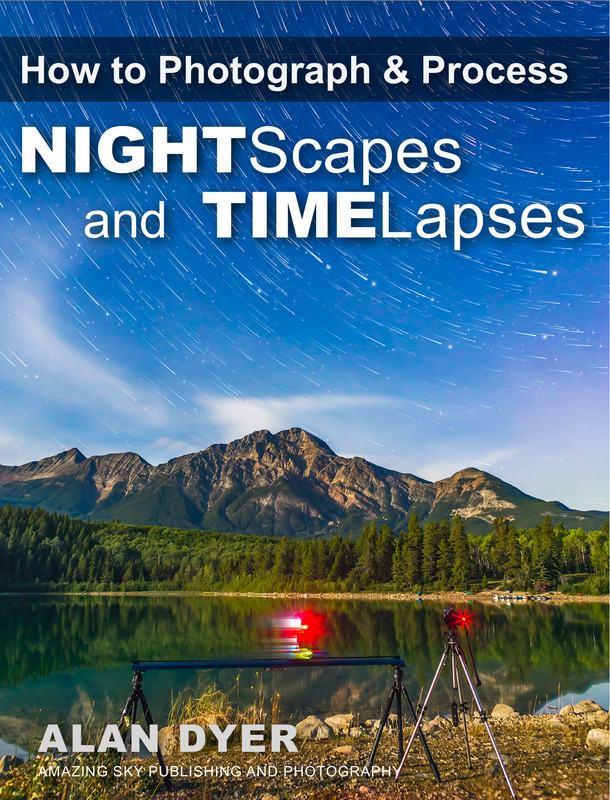 • How to assemble time-lapse movies from those same hundreds of frames. • How to plan a time-lapse shoot and calculate the best balance of exposure time vs. frame count vs. length of shoot, and recommended apps to use. • How to process hundreds of frames using Adobe Camera Raw, Bridge, Photoshop, and Lightroom. 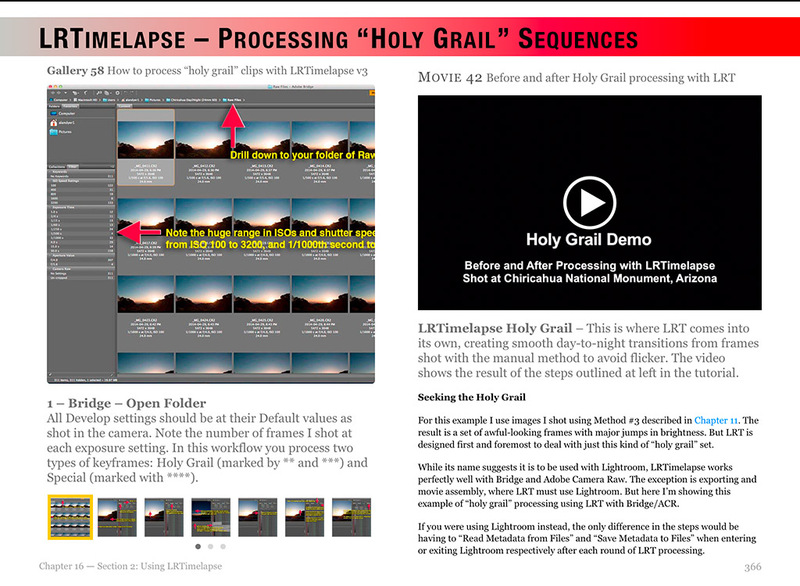 • How to shoot and process advanced “Holy Grail” time-lapse transitions from day to night. 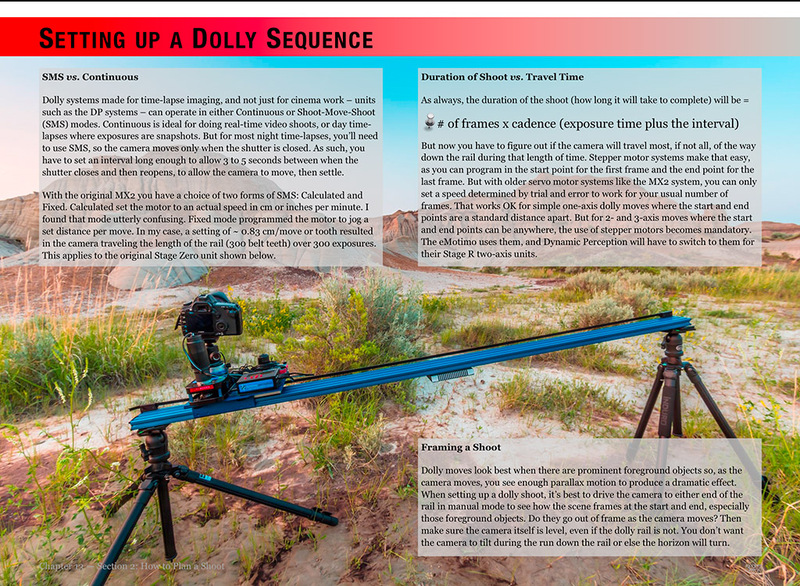 • How to shoot motion-control sequences using specialized dolly and pan/tilt devices. • How to use time-lapse processing tools such as LRTimelapse, Panolapse, Sequence, and Advanced Stacker Actions. • What can go wrong and how best to avoid problems in the field. It’s a large, multi-media book available only for MacOS and iPads through the Apple iBookstore. For technical and economic reasons, the book’s size and media content prevent it from being offered via other platforms such as Kindles and Android devices. It is not available as a static PDF or traditional print book. It’s subject makes use of an ebook’s ability to contain interactive and video content. See http://tiny.cc/urdoqx for more about the book at iTunes. Available worldwide. It’s $24.95 in the U.S.